Tej Bhatia is not exactly the cloak-and-dagger type, but, if pressed to explain himself, the affable, slightly built professor, with a mop of brown hair and thick mustache, is proof that appearances are deceiving. Tej Bhatia works with a student. Which is probably a good thing, considering his line of work. 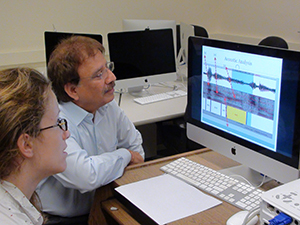 A linguistics professor in Syracuse University’s Department of Languages, Literatures, and Linguistics (LLL), Bhatia has held a myriad of positions on campus. In the College of Arts and Sciences, he oversees the South Asian Languages Program and has directed both the linguistic studies and cognitive science programs. But it’s Bhatia’s up-to-the-minute work as a fellow in the college’s Forensic and National Security Sciences Institute (FNSSI), where he conducts research and mentors graduate students, that has brought him recent acclaim. Case in point: Bhatia is spearheading a number of group research projects, several of which involve FNSSI and LLL and are seeking federal funding. Common to all of them are issues of trauma, identity decoding, fraud and deception, interpretation and translation, and trademark infringement. In fact, it’s been Bhatia’s work in trademark infringement, as of late, that has burnished his reputation as a leading forensic linguist. General Mills probably wouldn’t have settled its long-running trademark dispute with the Greek yogurt maker FAGE were it not for Bhatia’s recent expert analysis. At stake was use of the word “total,” which General Mills and FAGE have used to brand cereal and yogurt, respectively. One of Bhatia’s current group projects involves biometric forensic psychiatrics speech—a nascent, but rapidly growing field drawing on forensic linguistics and forensic psychiatrics. “This project seeks to bridge the gap between the study of the language of sentimentality, identity and trauma issues, by carrying out theoretical and applied research,” says Bhatia, who is collaborating with James Knoll, professor of psychiatry and director of forensic psychiatrics at SUNY Upstate Medical University. It’s likely that Bhatia will reference the Unabomber case—one of the more celebrated examples of biometric forensic psychiatrics speech, in which a reclusive mathematician mailed and hand-delivered a series of sophisticated “letter bombs” in the 1980s and ’90s, killing three people and injuring two dozen more. Bhatia says it was not gunpowder or DNA that led the FBI to the Unabomber; it was linguistic analysis—the study of word choice and other linguistic patterns found in the suspect’s writings—that cracked one of the biggest, most expensive criminal cases in U.S. history. The overlay of conscious deception is becoming more complex, says Bhatia, citing the case of Ted Bundy, a charismatic serial killer who assaulted and murdered a number of young women during the 1970s. “The goal of forensic linguistics is to take a multilingual approach to lie detection. Only through state-of-the-art technology and teamwork can we effectively navigate the slippery boundary between truth and deception, particularly in social media,” he adds. Clearly, forensic linguistics requires teamwork, and Bhatia has good people at his disposal. Among them are Bei Yu, assistant professor of information studies in Syracuse’s iSchool; Robert B. Murrett, deputy director of Syracuse’s Institute for National Security and Counterterrorism and professor of practice in public administration and international affairs in the Maxwell School; and colleagues at the Stevens Institute of Technology in Hoboken, N.J., where deceptive data is scrutinized within the framework of cognitive linguistics. Gail Bulman, associate professor of Spanish and chair of LLL, is one of Bhatia’s most ardent champions. “Tej’s work in forensic linguistics shows language as a key predictor of human behavior and is paving the way for developments in criminology, psychology and sociology. His research is among the most innovative and diverse in all of sociolinguistics,” she says. Another group project involves the study of deception on the Web and social media. The initiative, which Bhatia is submitting for funding in November, relies as much on mathematical modeling as it does on elements of linguistics, psychology, information and computer engineering. “When we transcend language and cultural barriers, the propagation of deceptive information through the Internet and social media portals can have severe sociological, physical, psychological and economic consequences,” he says. Bhatia is also a scholar of South Asian languages (e.g. Hindi, Urdu, Punjabi and Saraiki) that are deemed “critical,” by national security standards. As such, he was recently invited to lead a two-week workshop on language acquisition and language-teaching methodology at the Defense Language Institute Foreign Language Center in Monterey, Calif.
Central to his success there and at Syracuse has been the Threat Assessment Multilingual Database (CTAMD), which Bhatia has established and is one of the world’s largest repositories of “threatening” documents. Initially designed for the intelligence community, CTAMD may someday serve the public at large. Not everything Bhatia does is cloaked in intrigue. For example, he was recently invited to speak at a conference at Uppsala University, Sweden, about his recent discovery of the oldest grammar of Hindi, written in Dutch in 1698. This work was co-funded by the Japan Science Foundation and Japan’s Ministry of Education, Culture, Sports, Science and Technology.